Op zoek zuWinter, Weihnachten of Neujahrs bestemming? The winter start in October and ends in the beginning of May. The Kola Peninsula is like a fairytale, everything is covered by snow. The temperatures can go far under zero degrees of Celsius level, but it doesn't feel cold, because of the low humidity and lack of wind. 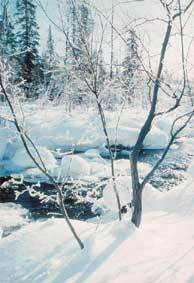 It is also a good reason to visit the Kola Peninsula in winter. Because Kola Peninsula lays above the Polar Circle we have from the end of November to the middle of January no sunshine anymore. This is called: the Polar night. That doesn't mean that during the day it is night here, but the sky is coloured like twilight from blue, purple, violet to red. The snow covered land takes over the colours of the sky. This wonderful view takes from 4 to 6 hours per day. We like the Polar night in our winter very much, because it makes everything cosy and romantic. Another natural phenomenon what you can often see in our winter above the Polar circle are the touching Northern lights (Aurora Borealis). A free spectacular laser show during the winter night, you even don't dare to sleep for watching it. The Northern lights can be only seen at the dark winter night, it means from September until beginning the beginning of April. Come over to experience it by yourself. You will be fascinated during your stay on Kola Peninsula. Where can a night be during the day?.........on Kola Peninsula!!! Experience the mysteries of the Polar night and Northern lights on Kola Peninsula!